Today, GDS and HM Treasury publish new clarification of business case guidance. We needed to explain how government organisations get permission to spend money on agile work. We consulted central government departments and the Major Projects Authority, who have been asking for this clarification for months. This will cut bureaucracy and encourage innovation, making digital transformation easier across government. The guidance clarification applies to major projects. But, it is good practice for government organisations to also follow the same principles internally when dealing with smaller spend. This publication clarifies that government organisations can spend up to £750k on discovery and alpha in most cases. 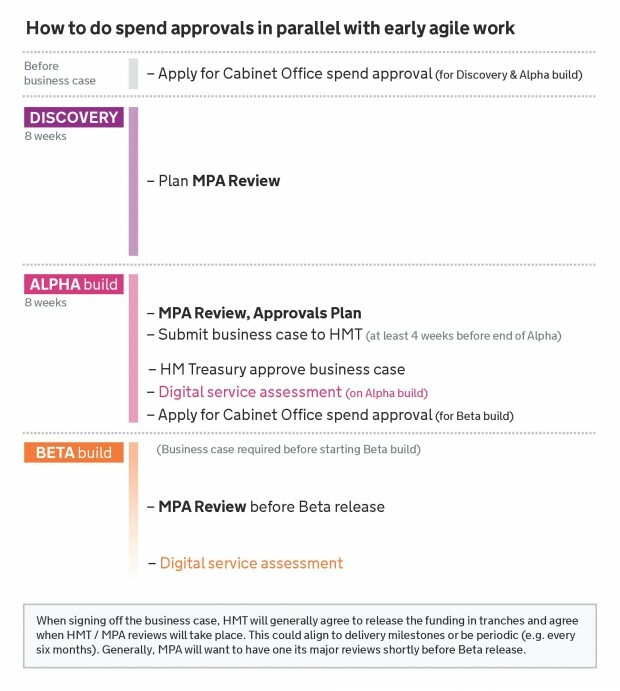 Cabinet Office spend controls can approve this - no need for an HM Treasury business case. The guidance clarification recommends that projects track progress against business cases using digital service demonstrations, agile burn charts and product backlogs rather than traditional lengthy IT documents. For people not involved in government spending, this may seem a bit dry. For agile and finance teams in government departments, this guidance clarification has produced incredible interest. I have had dozens of enquiries from people keen to see it published, and it produced a lively discussion at the Sprint 14 conference. This could be the most exciting administrative change this year in supporting an agile culture in government. So good to see this alignment. A first (or close to a first) in pointing the way to combining GDS Agile (if there is such a brand) with the need to invest taxpayers money carefully to ensure the best ROI. Not unreasonably the guardians of the taxpayer remain sceptical. The onus is on us to demonstrate value. Great news. Government business case approvals processes have been one of the main factors behind many project delays in the past. Some approvals take longer than the actual delivery! Anything that makes this slicker and more responsive is a big plus.